Problem: Even with a nice layer of clean gravel, this crawl space still has the effects of a typical unsealed crawl space. Humid air and water vapour enter a home through the porous foundation, crawl space vents and up from the dirt floor of the crawl space; resulting in a damp crawl space, musty odors and an unhealthy environment throughout the entire home. Solution: Wow – what a difference! Our team installed the CleanSpace® Crawl Space Vapor Barrier: a super durable 20-mil poly-reinforced liner. Now this clean and dry crawl space is a usable storage area and a healthier environment! Looking to have my crawlspace finished. I have been picking away at it for years but I need it finished. Need vapor barrier, insulation and a new pump and discharge system. No vapor barrier in crawlspace, freezing cold floors. Would like to see my options. My basement leaks in a few spots & would like an estimate regarding fixing it to prevent black mould & to be able to use my basement in a more functional way. Thank you. Installation of a back up system to my sump pump in crawl space. Our basement has never been drier or smelled better! Thank you for your professionalism and manner in which your company was represented. Very, very satisfied with the entire job. Edwin B. Mount Pleasant Cres. Our home was spotless after they left. Polite, good workers. Good warranty. I don't think you could find a better person for the job than Rene- he was excellent. We are very happy with the work. The job was completed on time and quickly. Second time using your company. A very fortunate company to hire such hard working, independent personal. "My husband and I, being a service business owner(s), can..."
"Belal was very good at explaining the work that was going..."
We not only adhere to the highest industry standards, we strive to be the industry leader in the home improvement related services we provide. We also use state-of-the-art products and technology which are designed to fix your home. We are the authorized Basement Systems dealer in Wallaceburg, ON. 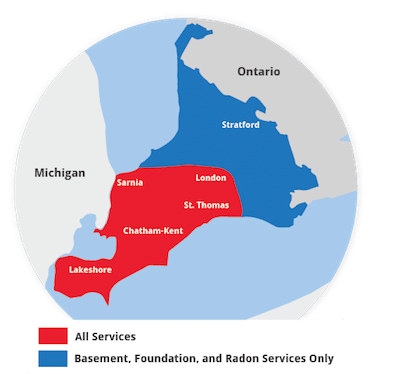 The lid that was installed is used to seal the Radon from leaking into the living space and is then exhausted out with the Radon Exhaust System. The system is used to exhaust the Radon from the living space. The moisture in the crawlspace was causing mould to grow in the school's classrooms. We installed our dehumidification system, the SaniDry dehumidifier, to keep the moisture levels down. Moving into a new house that has had past issues with flooding... would like to deal with this before new flooring is installed. We are looking at getting our crawl space insulated. Concrete block foundation in crawl space vertical cracks and separation. The sidewalk in front of my home is draining towards my house. Over time the sidewalk has settled and I need to have it lifted. Last night I just realized water is seeping in the basement. The side walk is about 5.5 ft wide and 16 ft long. Part of my concrete driveway near the garage might have to be lifted also.